Italian-style tortellini combines with Mexican seasonings in this main-dish soup. Make this chowder as spicy as you like with the jalapeno and chili peppers. In a Dutch oven or kettle, cook the chopped onion, the red sweet pepper, the green chili pepper, the garlic, and the jalapeno pepper in the 1 tablespoon butter or margarine for about 5 minutes or until the vegetables are tender, but not brown. Carefully stir in broth, potatoes, cumin, salt, black pepper, and ground red pepper. Bring to boiling; reduce heat. Cover and simmer for 25 to 30 minutes or until potatoes are just tender. In a small bowl or custard cup, stir together flour and 2 tablespoons melted butter; add to soup mixture. Cook and stir over medium heat until thickened and bubbly. Cook and stir 1 minute. Reduce heat and add corn, half-and-half, and tortellini. Heat through. 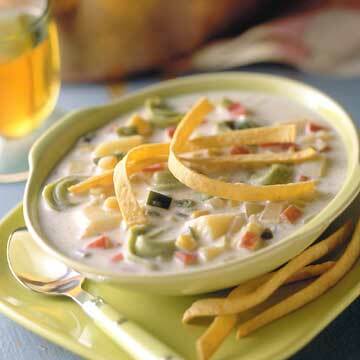 Ladle into warm soup bowls and top with fried tortilla strips or broken chips. Makes 6 to 8 servings.